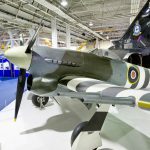 The RAF Museum announced a couple of days ago that their unique Hawker Typhoon Mk.Ib MN235 is now fully re-assembled and back on formal display at their London campus, the former RAF Hendon. 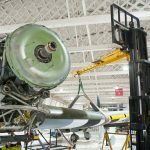 The aircraft had been on loan for most of the past four years at the Canada Aviation & Space Museum. 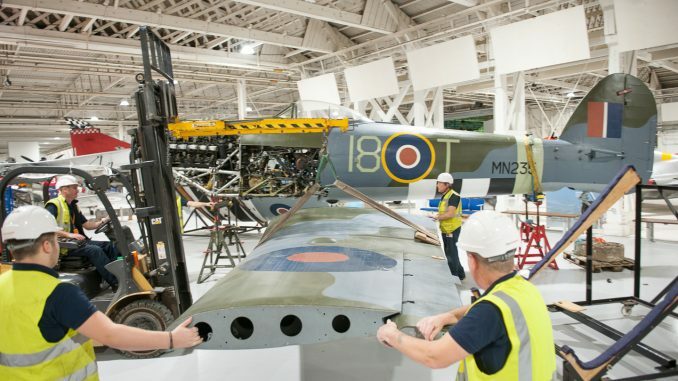 Although it arrived back in the UK in mid-April, it has taken a rather circuitous route back home to Hendon, where it arrived in a disassembled state in mid-October. 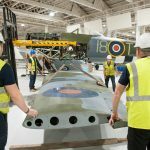 While the fuselage has been on display in the main hall since it arrived, it wasn’t until the end of November that a crew put her back together again. 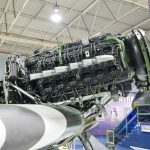 MN235 is the sole remaining original and complete Typhoon left in existence, and even that is due solely to the airframe having been transferred to the USA during WWII for testing. 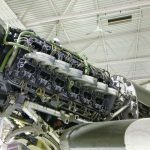 Every other example was either lost in a crash or scrapped by the late 1940s, although there are a number of partial airframes still out there, with at least two of these forming the basis for currently active airworthy restorations. MN235 never saw combat during WWII, but it still had an interesting service life. 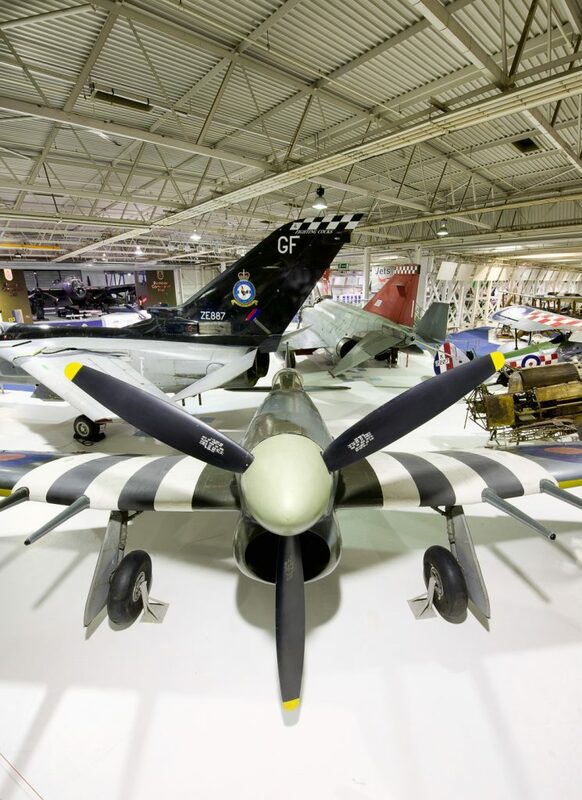 We have reproduced the RAF Museum’s aircraft history card here for our readers to learn these details. There are also remarks at its closing regarding the incomplete Typhoons still in existence. 1944: Built by the Gloster Aeroplane Co Ltd at Hucclecote, Gloucester. Fitted with 2,180hp Napier Sabre IIA Engine. Given airframe No.153219. 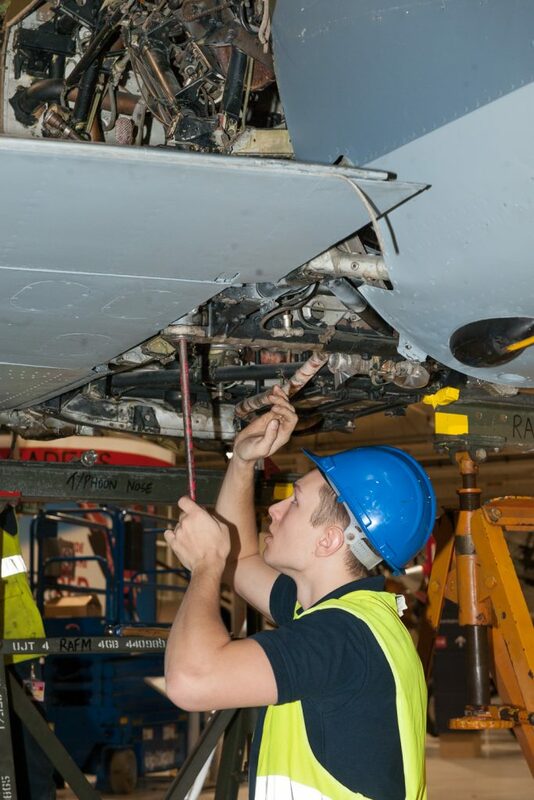 Part of Typhoon batch MN229 – MN269 which formed part of the 5th production batch of 800 aircraft, delivered Dec 43 -Jun 44. 8 Feb 44: First flight at Hucclecote Aerodrome, Glos – a 40 minute flight flown by Squadron Leader Allan H Smith DFC, serving as a test pilot for the Gloster aircraft company on rest after completing his first operational tour with No 486 (NZ) Squadron. 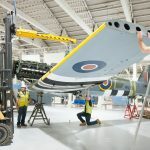 Squadron Leader Smith later commented that it must have been a good aircraft because he signed it ‘off test’ for delivery to the RAF after 40 minutes flying without any faults that would require another test flight. See logbook copy DoRIS ref. MF10029/12. 16 Feb 44: Off contract and allocated to 51 MU Lichfield, Staffs for storage. Mar 44: Allocated to USA for flight evaluation, in response to a USAAF requirement to investigate the Typhoons’ potential as a fighter-bomber and to increase its fuel capacity. 12 Mar 44: To 47 MU RAF Sealand, Cheshire for packing. 24 Mar 44: Shipped to New York on the `SS American Manufacturer’. 16 Apr 44: Arrived in New York. Last entry on movement card. Jul 44: Noted at Freeman Field, and photographed 6 Jul 44 after assembly. Photo assembled in USA – Aeroplane June 2004 p.82. 24 Jul 46: Again at Freeman Field. 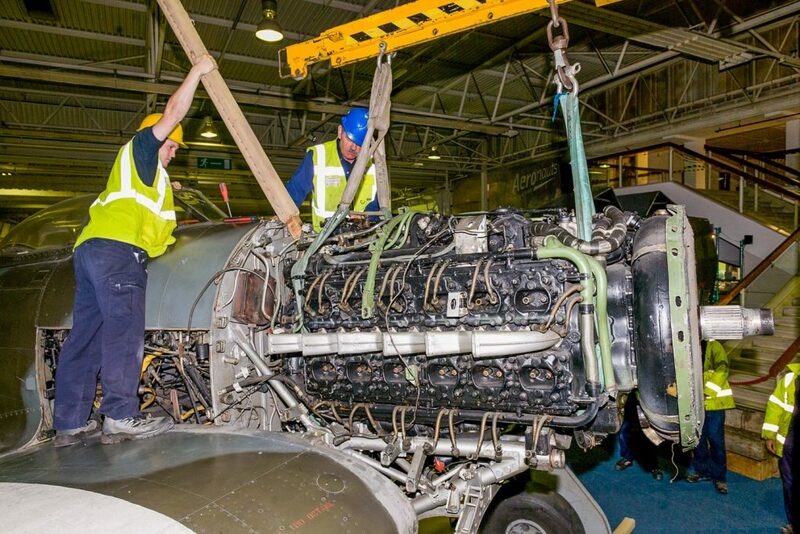 Engine prepared for storage. Total flying hours – nine. 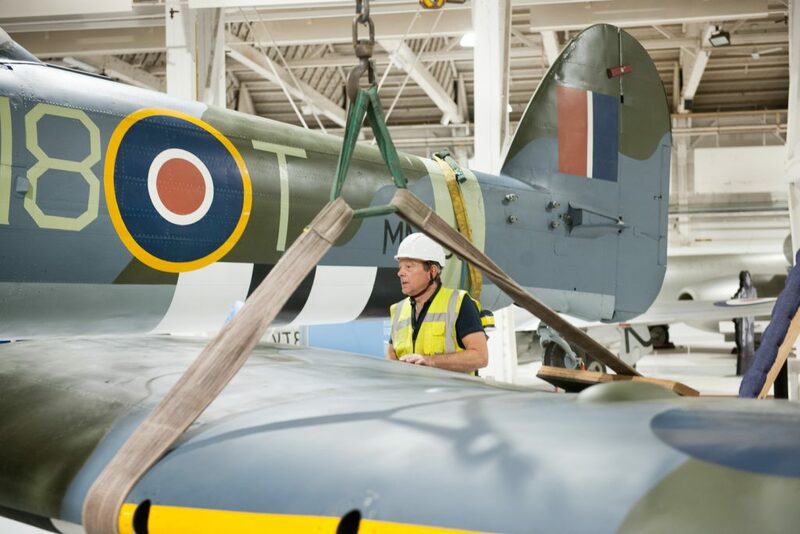 03 Jan 49: Allocated to the National Air Museum and eventually placed in crated storage at the reserve collection of the Smithsonian Institute, Washington. Apparently never on public display whilst in USA. Aug 1953: Letter in Air Pictorial (page 249) from Keith Boyer, who had seen `a Hawker Aircraft’ serialled MN235 – The Typhoon – at O’Hare International Airport, Chicago. Air Pictorial mis-identified the aircraft as a Hurricane, despite the correctly quoted serial number. The aircraft was stored for a future National Air Museum along with some 135 other aircraft. 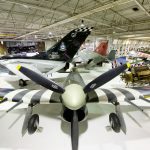 In the late 1940s, General Henry `Hap’ Arnold, Chief of Staff of the US Army Air Force, collected together sixty WW2 aircraft from all over the world and had them stored in an unused Douglas Aircraft Company factory at Park Ridge, Chicago, Illinois. 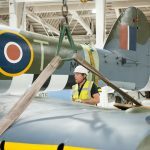 However the aircraft – presumably including the Typhoon – were evicted when the factory re-opened in1952 with the on-going Korean War. The factory site later became O’Hare International Airport. 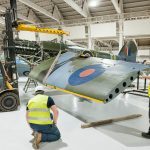 After a period of external store the aircraft were crated by the time Mr Boyer saw them, and they were moved to the newly acquired storage facility at Silver Hill, Suitland, Maryland by early 1955 from whence the Typhoon was extracted in 1967. This is now the Paul E. Garber facility of the National Air and Space Museum. Apr 67: RAFM request to Smithsonian for Typhoon to be returned to the UK. Aircraft prepared for shipment. Jul 67: Presented to RAFM by Smithsonian. Hurricane IIc LF686/5270M given in exchange by RAF 1969. 4 Jan 68: Shipped back to England from Baltimore to Liverpool Docks on S.S. Samaria. Taken by road to 71 MU Bicester for survey of work needed for restoration. 9 Apr 68: Transported by road by 71 MU to 27 MU Shawbury for restoration to display condition by a largely civilian team, restoration beginning 26 April 1968. 19 Nov 68: Restoration completed and aircraft formerly presented to Dr John Tanner of the RAFM by Wg Cdr D A Gifkins, CO of 27 MU. 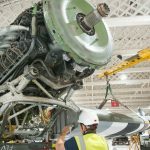 Aircraft remained in store at Shawbury. Photos: Aircraft Illustrated Feb 69 p.48; Aero Modeller Feb 69 p.63; Royal Air Force News 14 Dec 1968. Colour photos at Shawbury – Aircraft Illustrated Apr 71 p.151 and Wrecks and Relics – The album p.55; Hawker Typhoon Special Mach 1 (Thomas) p.13; Flypast May 2008 p.20. Feb 1972: Repainted by 27 MU at Shawbury. By Nov 1972: Moved to Hendon for Museum opening and displayed in Camm Hall area ever since. This area is now known as the `Fighter Hall’. 1994: Centrepiece of `D-Day’ display – some repainting scheduled. 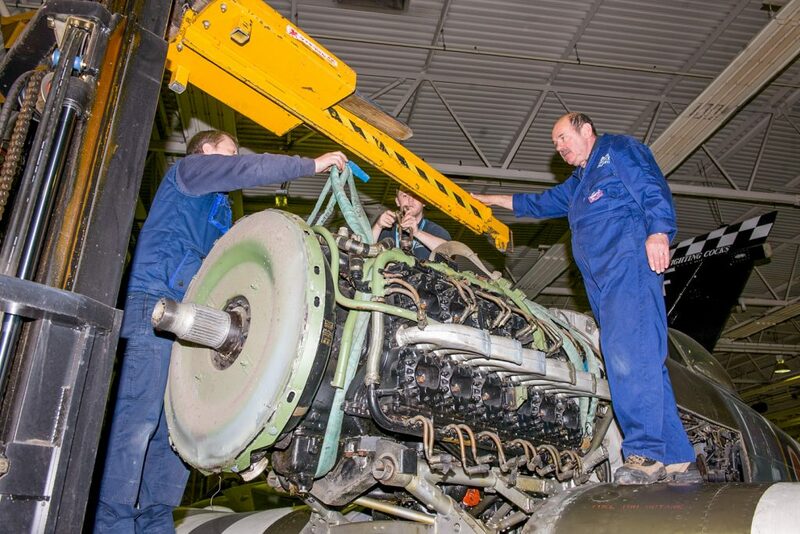 4 Nov 2013: Dismantling underway for move to MBCC RAFM Cosford for attention. 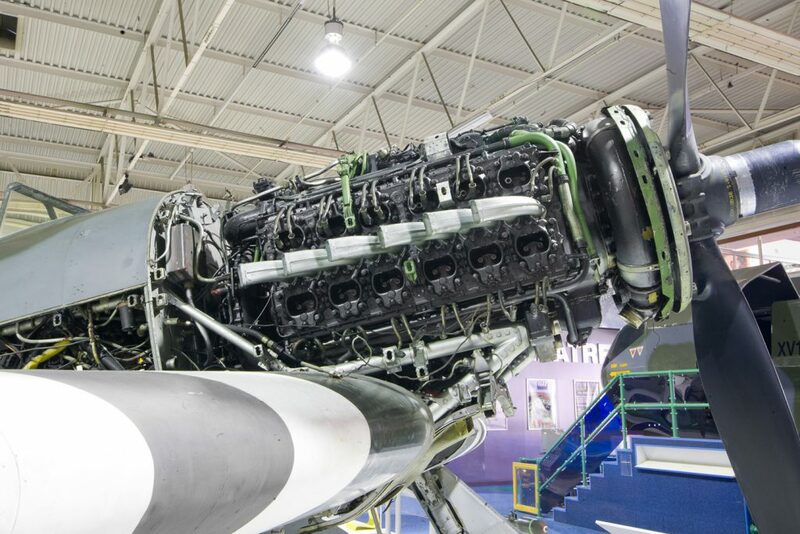 7 Nov 2013: By road to MBCC at RAFM Cosford. Photos as delivered – Flypast January 2014 p.7 and April 2014 p.32; February 2014 pp. 90-91; Wrecks and Relics 24th Edition (2014). Repainted in representative markings of a Typhoon of No 440 Squadron RCAF, codes I8-T; fuselage repainted by 10 March 2014. Photos of fuselage and wings; Napier Heritage News 83 Spring 2014-cover; Flightpath Vol 25 No 4 p.27, 2014. 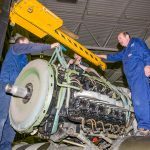 Nov 2013: Excavations by the volunteer Freeman Field Recovery team found the complete missing Typhoon Radiator core and at least one engine cowling amongst other buried aircraft parts, plus a complete Typhoon main undercarriage leg, propeller blades and other spares. 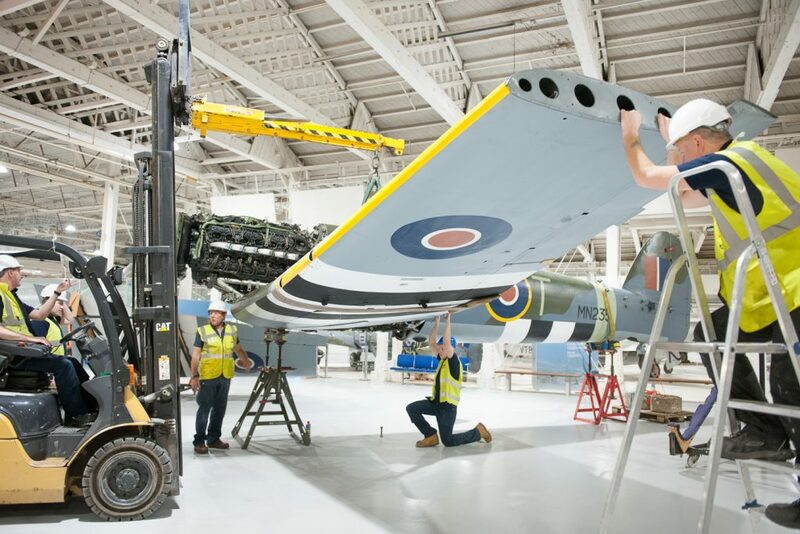 8 May 2014: Despatched by road to RAF Brize Norton en route to Canada for loan to the Canada Aviation and Space Museum, Rockliffe, Ottawa. Flown out by RCAF C-17, 17 May 2014. 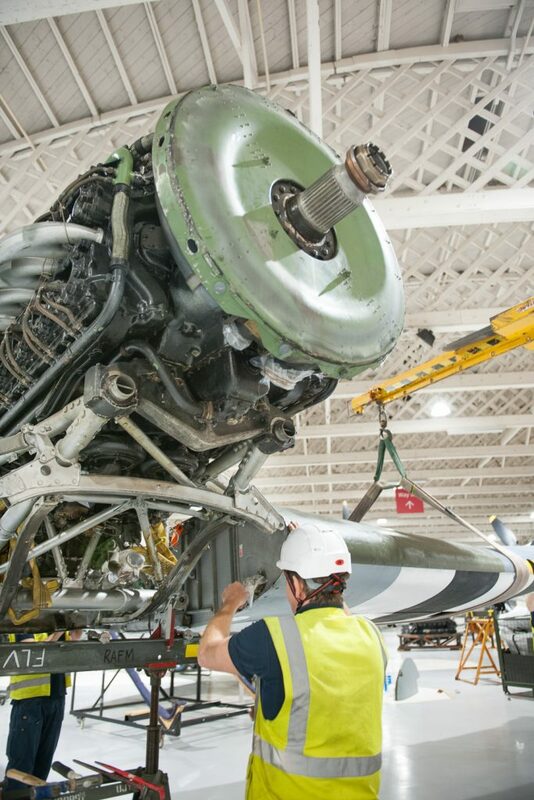 Photo being unloaded – Classic Wings Issue 93 p.15. 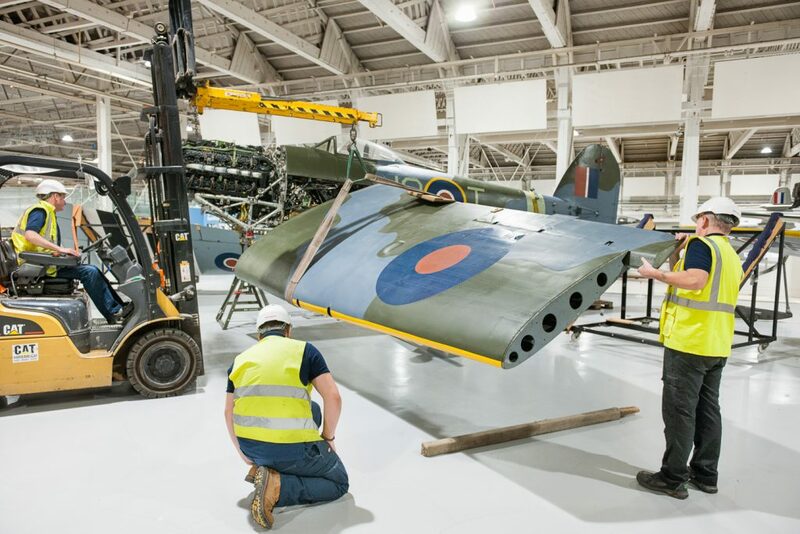 4 June 2014: Following assembly, towed from conservation hangar to main display hall at Rockcliffe. 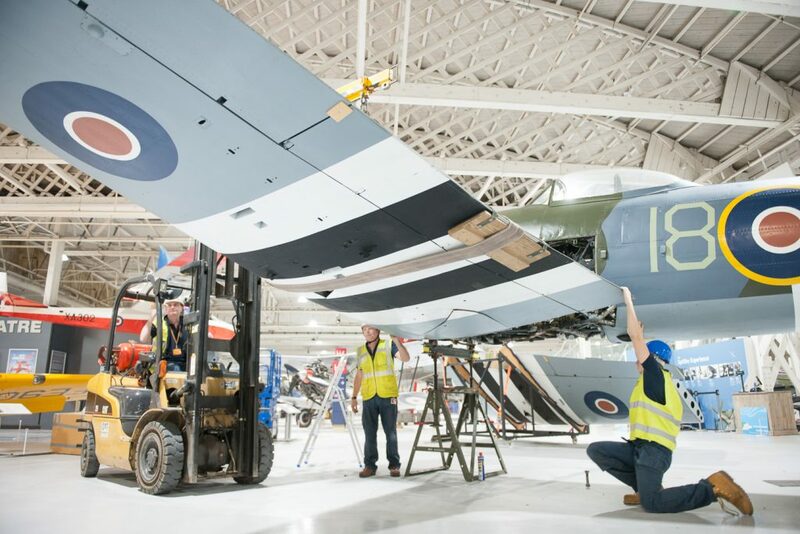 Formal unveiling on 6 June 2014 – 70th anniversary of D-Day. Photos on display; Flypast August 2014 p.16; Aeroplane August 2014 p.8; Flightpath Vol 26 No 1 (2014) p.6..
12 Apr 2018: Arrived back in UK via Liverpool docks. 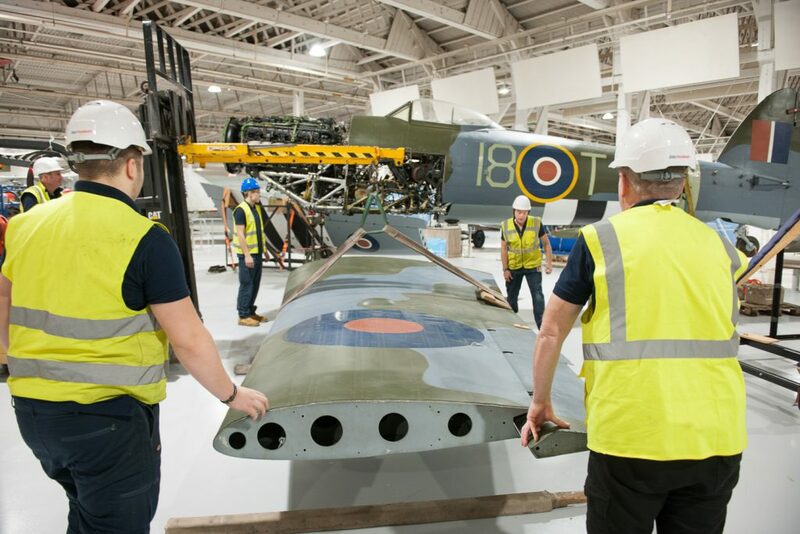 18 Apr 2018: Following its return from Canada, to temporary storage at RAF Museum Stafford. 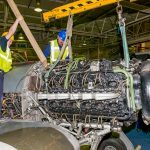 23 July 2018: By road from Stafford – Temporarily on loan to BAE Systems/RAF Coningsby. ‘Rolled Out’ at Coningsby on 27 July. Photos- Aeroplane September 2018 p.8. ; Aviation News September 2018 p.22; Britain at War September 2018 p.6. 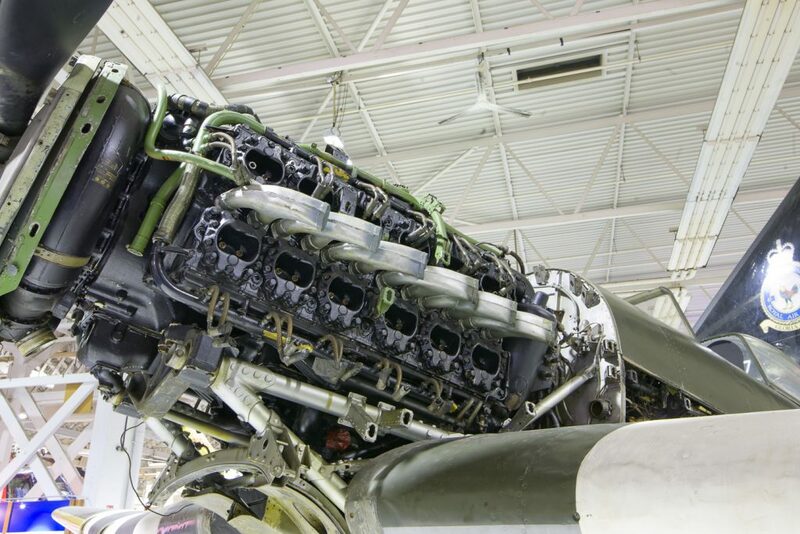 For display in BBMF hangar. Mk.IB sectioned IWM, Duxford. On display in main Superhangar on mezzanine. R7708 Mk.1B (Car Door) Peter Smith, Kent BoB Museum Hawkinge (ex 609 Sqn/Pegwell Bay). Identity from recovered parts. Phil Earthy, Norwich – formerly held a collection of parts, Mk.1B.Project moved on by 1998. Mk.1B Ex the late Mike Cookman, Leeds. Later sold to Brian Barnes, Coventry identified as `JR505′. Photo: Wingspan Aug 95 p.50. 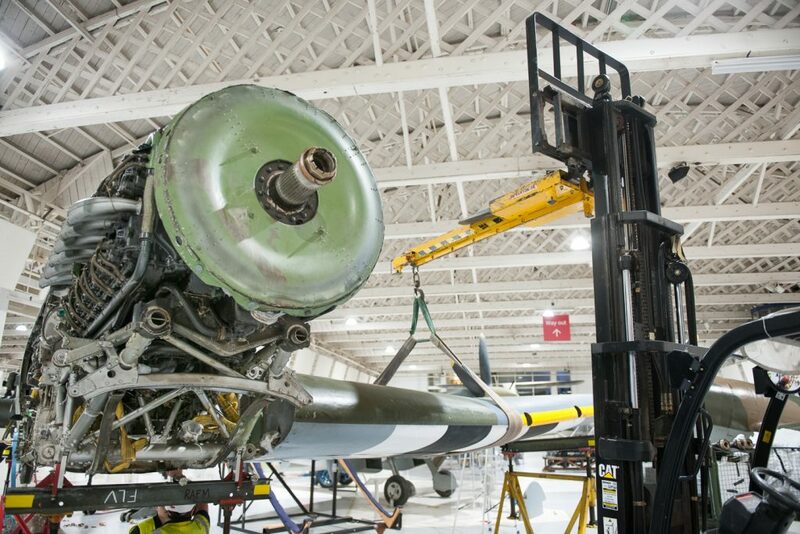 Formerly at Midland Air Museum; fwd fuselage frame; currently in store. 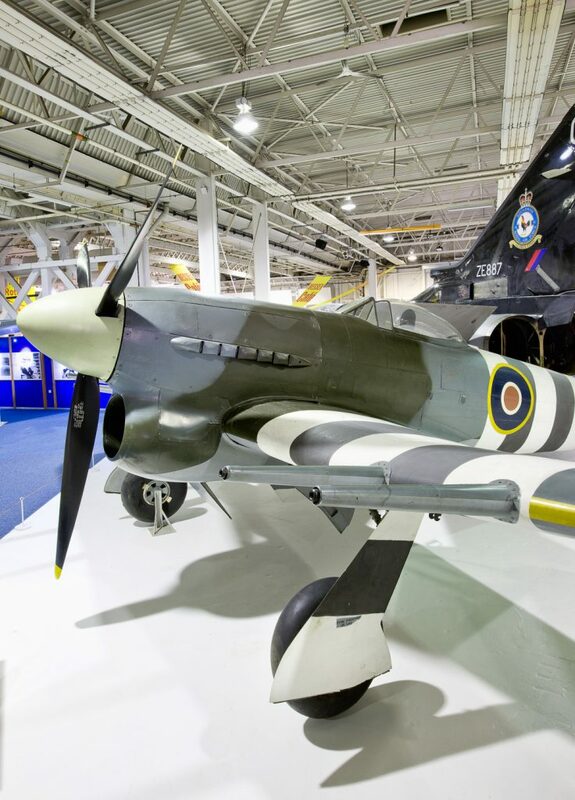 Mk.1B Previously with Barry Field/Museum of D-Day Aviation, Shoreham airport (sold 2003 – with engine-now moved to France) Composite using original Typhoon and Tempest components. Roger Marley, Shrewsbury, was constructing a substantial Typhoon IB cockpit/fuselage section ‘JP843/PR-L’ incorporating original cockpit, firewall, front and rear spar, controls and instruments. Photo – Flypast September 2010 p.85. 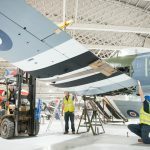 Rear fuselage of Sea Fury FB.II VW589, ex Malta 1989, also held for the project – previously with Peter Smith at Hawkinge. Project acquired for export to Canada, 2015. See www.typhoonlegacy.com. 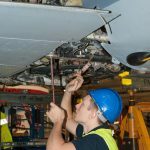 A substantial section of Typhoon port wing, ex Belgium, was identified in the USA in 2016 and acquired for the JP843 restoration project. Mk.1B ‘car door’ variant Ex scrapyard forward fuselage with Gloucestershire Aviation Collection (Jet Age Museum) ex Brockworth and Twyford, Recovered from Flowers yard, Chippenham by Retro Track & Air UK 1998. 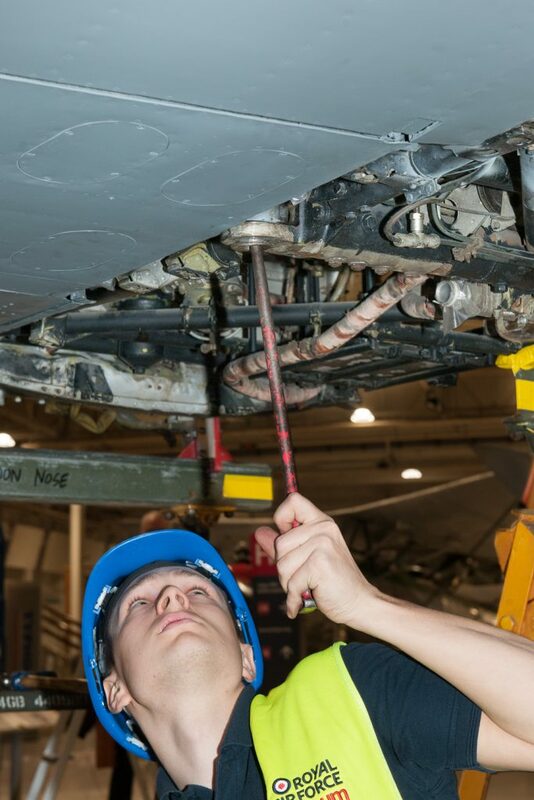 See http://forum.keypublishing.com/showthread.php?141512-J-A-M-Car-door-Typhoon-rebuild BAPC .363. Mk.1B Cockpit – Previously with Air Defence Collection, Salisbury-at Boscombe Down 2004; to Aero Venture, Doncaster, by 2008, along with another Typhoon I cockpit section, ex Staverton – both unidentified, and on loan from Naylan Moore’s Classic Aircraft Collection. And possibly a pair of wings in France. Former 609 Squadron. Volkel Air Force Base, Netherlands display the engine, propeller and radiator of Typhoon IB RB250 which crashed on 13 April 1945 – photo Flypast September 2013 p.10.